Presents a comprehensive yet concise examination of issues related to media and communication law in Arkansas. This book is designed to be a valuable reference to state law affecting communication professionals and students. The series examines issues that rise in daily news-gathering and reporting activities. Such issues include privacy, obscenity, and advertising laws as well as open meeting, open records, trial access, and newspersons privilege provisions. This is an important, easy source for all those whose life or profession makes them vulnerable to potential lawsuits due to infractions of the media/communication laws. Help protect yourself with this book! 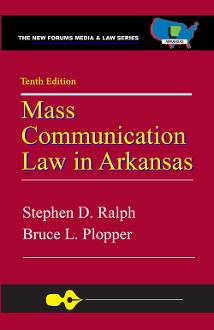 For years, Mass Communication Law in Arkansas has been the essential, go-to resource for journalists, newsroom managers, publishers, and students on the legal do’s and don’ts for news-gathering professionals. The authors explain in a straightforward and useful way how laws affect the reporting business and how reporters and organizations can protect themselves against lawsuits. The book addresses subjects such as the Freedom of Information Act, advertising regulations, privacy, and other timely topics. Anyone in the news business in our state needs a copy of this book. Publishers and general managers should make it required reading for their organizations. STEPHEN D. RALPH is an attorney living in Conway, Ark., and practicing criminal law. He has taught college courses in media and in radio-TV production, and he currently teaches media law and ethics at the University of Central Arkansas. Mr. Ralph has a B.S. degree in radio and television and an M.A. degree in speech communication from the University of Illinois. He received a J.D. degree from the Bowen School of Law at the University of Arkansas at Little Rock. BRUCE L. PLOPPER teaches undergraduate and graduate classes in the School of Mass Communication at the University of Arkansas at Little Rock. He specializes in mass communication law and journalism history, but he also teaches a variety of other courses. Dr. Plopper earned his B.S. degree in psychology from Michigan State University, his M.A. degree in psychology from Southern Illinois University in Carbondale, and his Ph.D. degree in journalism from Southern Illinois University in Carbondale.